In a battle of the clear-cut Old Dominion Athletic Conference (ODAC) leaders, somebody’s streak would have to end. Guilford College entered on an 11-game streak. Host Eastern Mennonite, which had won nine in a row, took control early Saturday afternoon and pushed their run to 10 straight wins with a 54-47 decision over the Quakers. The Royals take over sole possession of first place in the ODAC at 13-1, while Guilford slips one step back at 12-2. Based on two head-to-head wins, EMU also holds the tie-breaker over Guilford should the two teams finished the regular season tied. Each has two games left before the ODAC Tournament. Saturday in Harrisonburg, the Royals turned on their defense and never trailed. They held GC to just two field goals over the opening 12:07 of the game and led 17-7 when Alisa Brown (Dumfries, VA/Forest Park) converted a three-point play at the 8:09 mark. The Quakers got within three points at 18-15, but Eastern Mennonite closed the half on an 11-2 surge, capped by a pair of Steph Rheinheimer (Manheim, PA/Lancaster Mennonite) three pointers. EMU led 29-17 at the half after holding Guilford to just 21% shooting and grabbing 15 offensive boards. A hot start to the second half pushed the Royals’ edge to 17 points at 37-20, to make a combined run of 19-5 with the end of the first. Even after a small GC run, Eastern Mennonite had the lead back at 50-33 after a Kala Yoders (Myerstown, PA/Eastern Lebanon County) bucket with 4:36 to play. With the big lead, EMU slowed down over the final minutes and the Quakers closed on a 14-4 surge, but it was much too late. Both teams showed a lot of defense in the game, with both offenses shooting just 31% from the floor. The Royals made the biggest difference on the boards. They grabbed 21 offensive rebounds and had 53-45 advantage over the best rebounding team in the ODAC. 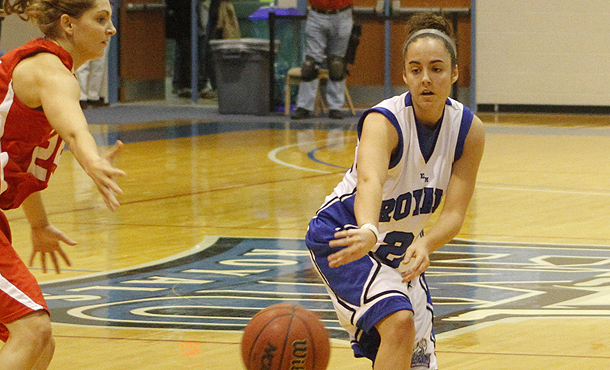 Yoders provided Eastern Mennonite with their inside presence, co-leading the team with 12 points and two steals. Rheinheimer gave the outside punch, going 4-for-9 from three point range for 12 counters. Bianca Ygarza (Conestoga, PA/Penn Manor) had a team high nine rebounds. Brown, Shakeerah Sykes (Dumfries, VA/Forest Park) and Raiven Patterson (Pulaski, VA/Pulaski County) each added seven points. Gabby Oglesby (Winston-Salem, NC/Mount Tabor) had a double double for Guilford, topping all players with 13 points and 11 rebounds. Jaclyn Nucci (Gambrills, MD/South River) grabbed 10 rebounds and four steals. The Royals, 17-5 overall, have now won 10 in a row, which is tied with the 1987-88 team for the second-longest streak in program history. In 1984-85, the Royals won 12 straight. They head into the final week of the regular season with a big road game at rival Bridgewater Tuesday night. The Eagles are tied for third in the ODAC at 10-4. EMU won the previous meeting this season, 57-48, on Jan. 24 in Harrisonburg.